Like many of you, I have a mad love affair with quilting. I love every bit of it, from the fabrics, to the designs, to the quilting. But not everyone enjoys all aspects of making a quilt. Some people prefer someone else to do the quilting for them. My specialty is custom quilting, with edge-to-edge designs available also. I'm currently taking customer quilts. All 1st time customers get 10% off their first quilt and if you refer a customer to me, you also get 10% off your next quilt. If you would like yours quilted, contact me by filling out the form or call me at 217-273-5536. 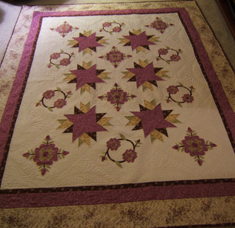 After receiving your quilt, I'll coordinate with you on crafting the best design for your quilt and budget. I'm located in rural Sullivan and you can drop quilts off by appointment. I'll also meet you at a local quilt shop (if the owner is ok with that) and if necessary I can meet with you in the comfort of your home.